As a Lowe’s Cre­ative Ideas Blog­ger (*this is a sponsored post), this month’s chal­lenge was all about outdoor projects! 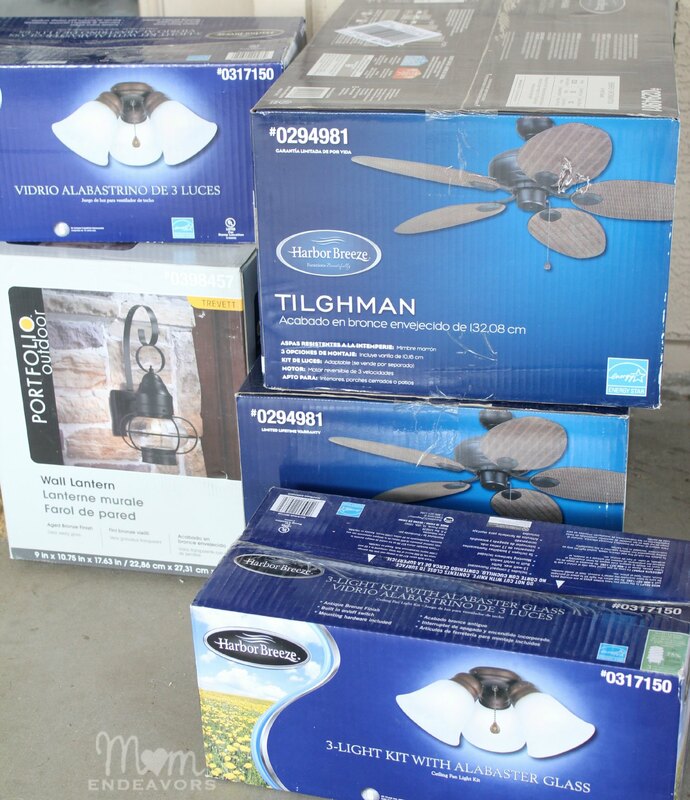 One outdoor project we’ve really been wanting to do for some time now is getting new patio lights and ceiling fans. 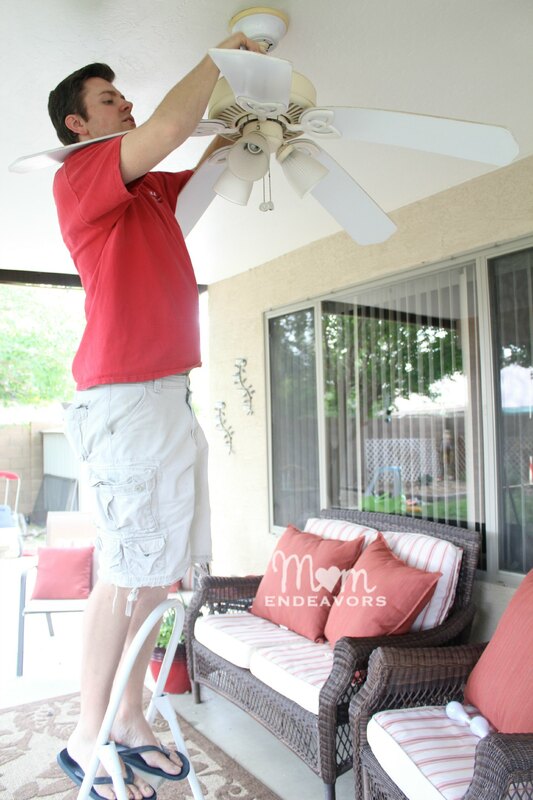 Earlier this spring we did a little mini patio makeover, but there was still one major eye-sore… Oh dear, those sad, sagging ceiling fans! Trust me when I say that they looked even worse in person than they do in this picture. 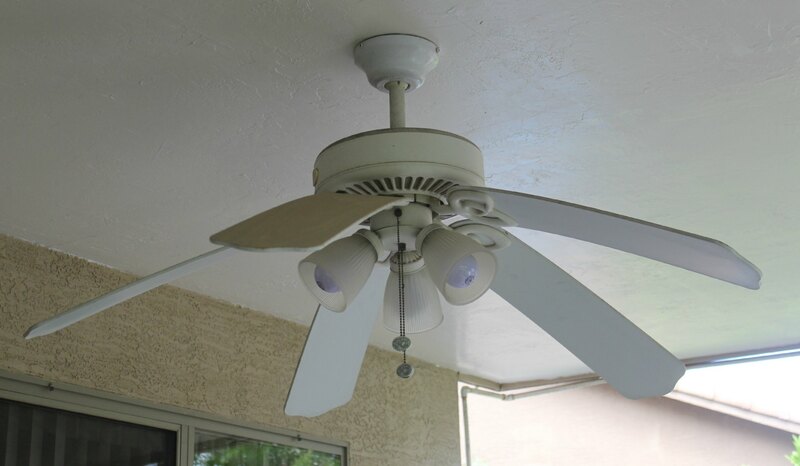 The house was built in ’98 and I’m sure these were the original fans installed on the patio. In addition, it doesn’t look like they were outdoor rated. So, over the years, the fans had become horribly weathered and saggy! See?! Not pretty! We wanted something that would not only look nicer, but be more suitable for outside and hopefully not get all saggy & warped! We found some great options at Lowe’s! 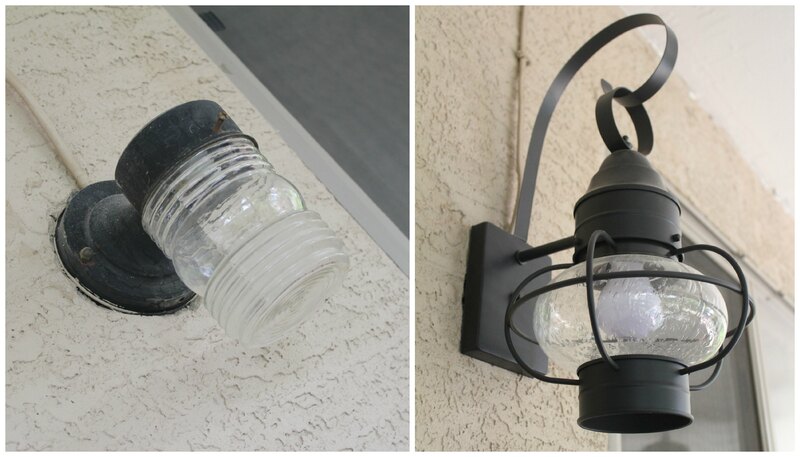 Since we were updating the fans, we decided to replace the back porch light as well. Here’s a peek at what we got: Thankfully, install was really pretty easy! Mr. Mom Endeavors & my cousin were able to get everything swapped out in just a couple of hours! Look at how yellowed this one was! Blah! 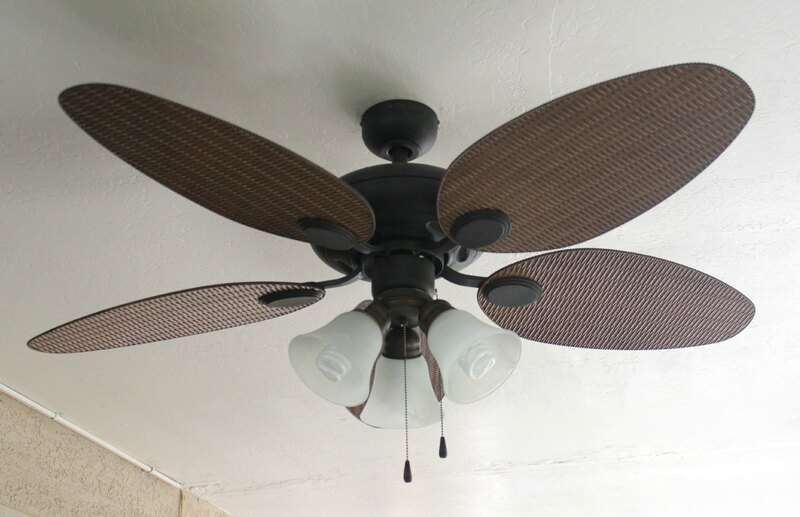 So, in just a couple of hours and a bit of DIY install, we went from saggy, discolored, “blah” fans to much prettier & fun! Don’t you think?! It ties everything together so well! I love them! Plus, they give off so much more cool air than the old droopy ones–and loads more light too! More functionality and more aesthetically pleasing is always a huge win! 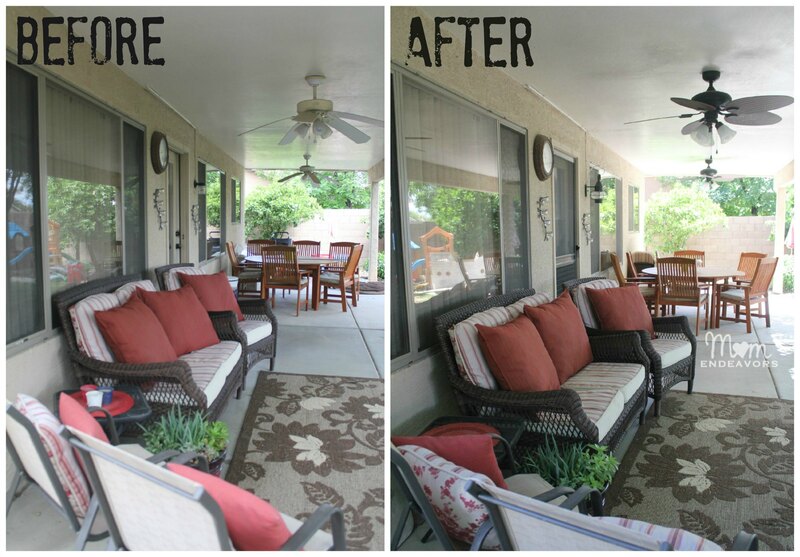 You can see in the above image that even the back patio light got a makeover. The original light was small and boring. So, we opted for something quite a bit larger and with some character. It doesn’t match the fan style, but we still like it a lot! An easy and inexpensive upgrade for sure! So, needless to say, we are very much so enjoying our patio this spring! We made sure to complete all the updates prior to hosting Easter and the boys’ birthday party. They certainly weren’t necessary fixes, but it’s nice to do some vanity updates every now & then! 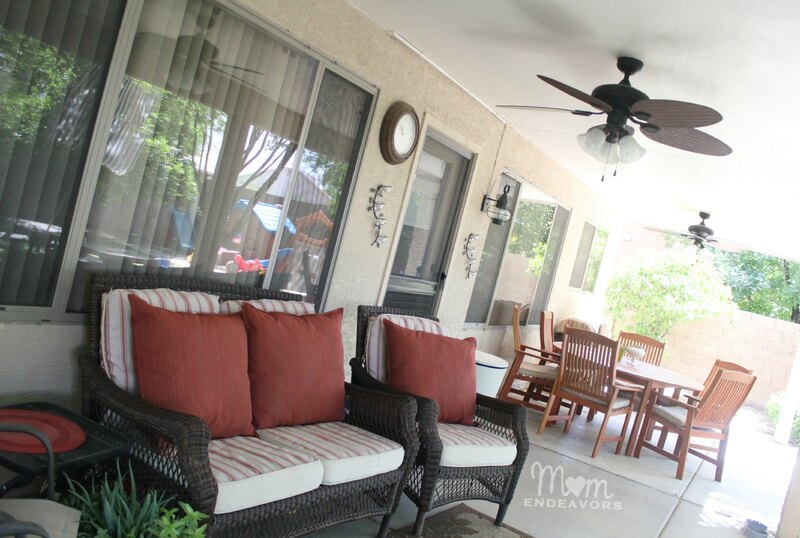 Here’s the complete before & after: What patio updates would you like to make? For even more ideas, visit Lowes Cre­ative Ideas and fol­low along with Lowe’s on Pin­ter­est or on Insta­gram! You can also sign up to receive their free Cre­ative Ideas Mag­azine, which is full of all kinds of ideas & inspi­ra­tion! There’s also a mag­a­zine app so you can have inspi­ra­tion on the go! Beautiful updates! Those fans and lights are gorgeous. Thanks, Jenna! Amazing what a difference just a few different fixtures make! What an amazing difference Sara! I love the new fans! Those look so much more “tropical” and perfect for your space! Great job! Wow those sagging fans were crazy! What an easy way to improve the space! It looks great! It is amazing what a difference good lighting styles can make. 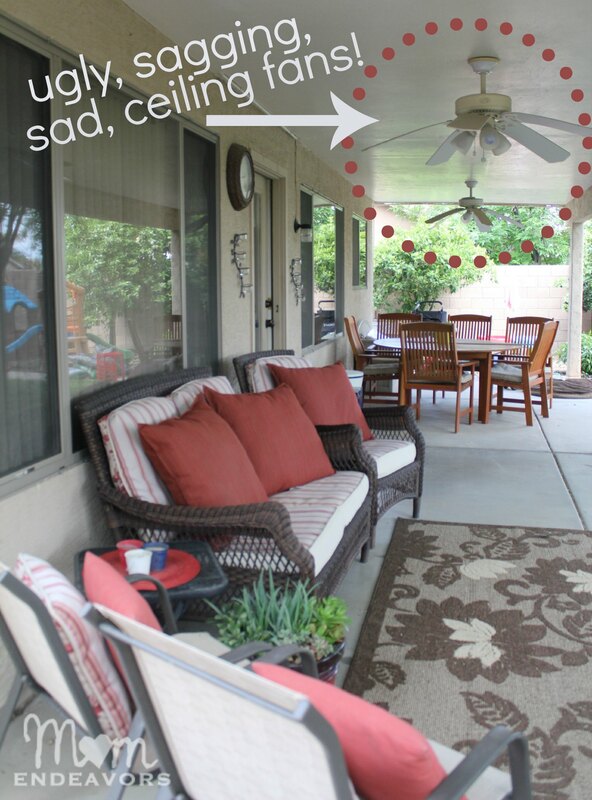 Your porch looks so comfortable to relax on!